Until not so long time ago, in third world countries not so far away, dolls, real plastic dolls, were a luxury. Getting a real Barbie was not only a sign of prestige, but real delight for girls (and an occasional boy) who would remember that moment forever. In the time before cheap knock-offs made in China, kids who wanted to play with dolls had to either rely on kindness and skill of aunts, grannies or moms who would made them rag-dolls, or they had to collect paper dolls. Yea, we had to play with paper dolls. It was rather cool. You would get your favorite magazine and carefully cut out the doll and all the different clothing and accessory items. They had this white extensions so you could glue your doll to nice piece of cardboard and use white extensions to fold and let the items ‘stick’ to your doll. Some would glue the dolls to soda cans or bottles and display them. Others played with the paper dolls just one would with the real dolls. What am I saying, they were a real dolls! Long before they were delight of the poor kids everywhere, paper dolls were quite a luxurious novelty themselves. Paper dolls have been around as long as there has been paper. In Asian cultures, paper was medium for making ritual masks. Paper was also used to adorn ritual statues or effigies with clothes or faces. Some estimate that art of folding paper is dating back to 800 AD, and of course there have been figurines folded in shape of kimono. Balinese people made leather and paper puppets, but as soon as paper became known in the West, paper dolls soon followed. In the early 18th century, paper dolls were popular in Germany, Poland and France. Fun fact: paper dolls were entertainment for adults. They were folded with joints to make jumping jack puppets and they were all the rage in high society and courts. Paper dolls were painted like people and elaborate fashion was created for them. For some reason, in 1791. London paper dolls were heralded as ‘English Dolls” and featured eight inches high female figure with set of clothes, under clothes, hair styles, corsets and six different outfits. Inspired by paper dolls depicting European royalty and famous (or infamous) actresses, first American paper doll productions started around 1800. Paper dolls became rather popular in the USA mostly thanks to dolls representing Hollywood stars and other celebrities. Companies published paper dolls in magazines for sake of advertising. From 1930s to 1950s it became customary for children apparel, soaps, nail polish, but also cars (Ford!) to be boosting sales by publishing die-cut paper dolls, or dolls printed on cards for kids to cut out. When Barbie dolls arrived they were of course the most popular paper dolls. Kids around the globe, who could not afford the real Barbie, entertained themselves with paper versions of Barbie, Ken or Skipper. Then from 1960s towards end of 20th century, paper dolls declined in popularity with arrival of cheap plastic dolls and with luxurious Barbie dolls becoming more and more affordable. By 1990s paper dolls were dead as commercial product, turning the paper dolls into art and hobby with avid collectors and new editions circulated among circles of diehard fans. Kisekae, or kisekae ningyou (dress up dolls, in Japanese) saved the paper dolls from oblivion. With rise in popularity of manga and anime, Japanese started making websites with drag and drop clothes for dolls fashioned after popular manga characters. It was such a boom that entire standard was developed – KiSS. Namely, Kisekae Set System was developed to allow artists to make standardized sets. Defining colors, resolution size and layers, KiSS allowed for layered clothes, as well as customized faces, hairstyles, makeup and objects, like items, props, houses, vehicles. KiSS also brought ability for dress up games to contain puzzles, interactive elements, simple animations. By the time Adobe introduced Flash technology in 2007, dress up games experienced another big boom. Not only number of websites grew, the number of artists increased and dress up games became so popular and abundant that saturation was almost instant. Funny thing happened. Computer technology allowed both doll-makers dealing with traditional paper doll art and new virtual dress up doll fans to vastly expand their activities. Two groups are not really in warm relationship, but dress up games and paper dolls are experiencing new renaissance ever since 2010s. As you noticed, CloudNovel has separate editor for dress up games and features more than dozen of dress up games, often titled avatar creators. 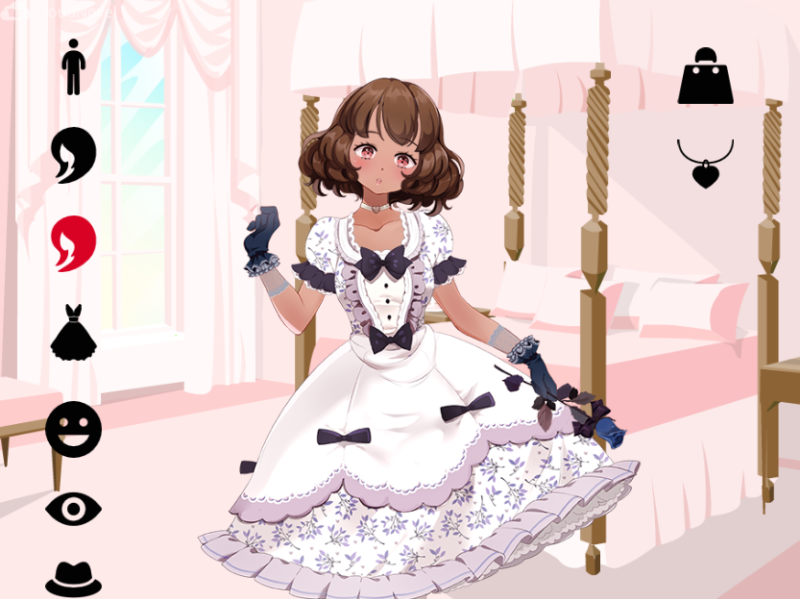 Main reason for giving such love for dress up games is that they represent awesome way to create your own characters for populating your Visual Novel masterpieces. That’s why it’s so good we have so many ‘god tier’ artists that are working on their dress up games. Simply create your character in one of our official dress up/creator games and then save the avatar as PNG. You can also take snaps and save characters you’ve created in other dress up games out there. Just add the asset as you would usually to your Visual Novel’s library, be it through hosting it elsewhere, or using our Pro feature (only $2.49) to host it at our Amazon powered servers. So, what are you waiting for? Go make some games, grab nice characters and let us know what you’ve created, we can’t wait to read your stories! Next: Next post: What are Kinetic Novels?